13-year-old Hania Aguilar was abducted outside her home in early November. Authorities say a body found last week was preliminarily identified as Aguilar, though a final confirmation will be made using dental records. 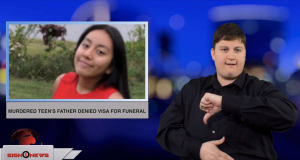 Unfortunately the girl’s Guatemalan father has been denied a temporary visa to enter the US for her funeral. An online petition requesting a temporary visa garnered more than 50,000 signatures. The father’s lawyer says officials denied the visa because the father doesn’t have enough ties to the country. The FBI is offering a $25,000 reward in Aguilar’s case and the state of North Carolina is offering a $5,000 reward.